McArthur were an all male vocal quartet founded by former Royal Joker, Willie Cornelius Jones during 1974. Willie had begun the early 1970’s as the lead singer and founding member of vocal group The 21ST Century who later, due to a name clash with The 21ST Century on RCA, became just The 21ST. Following the disbandment of The 21ST during 1974 Willie set about forming a further group that he vaguely remembers featured Cheslawn Vickers at the time a serving Police Officer who timed his annual leave to coincide with the groups tours. A guy called Larry and a fourth member who Willie couldn’t recall his name. Willie again was the lead vocalist and the elder statesman of the group at the ripe old age of 35 years. Willie’s new ensemble needed a name and they finally chose what they perceived to be a strong and instantly recognizable name when they became ‘McArthur’ in honor of the United States Supreme Commander of the Allied Pacific Forces during World War II, General Douglas McArthur. Through his previously made connections as part of The 21ST, Willie returned to Canada with his new ensemble ’McArthur’ securing two performing dates at The Arrows Club in Halifax, Nova Scotia. ‘McArthur’ finally broke up after a period of circa 18 months together with their lasting legacy being a solitary 45 single “It’s So Real/I’ll Never Trust Love Again” which gained a release on the New York based Mainstream subsidiary label, Brown Dog (BD9006) in 1975. Both sides of the 45 were produced in Detroit by Clyde Clay and Charles ‘Teddy’ Johnson for Funhouse Associates, with Teddy Johnson being an old High School friend of Willie Jones. The A-side “It’s So Real” was written by the late legendary baritone Saxophonist Andrew ‘Mike’ Terry and William Marvin Smith a respected bass guitarist and one time child protégé of Johnny Mae Mathews and Dave Hamilton. William had previously been a member of Lou Beatty’s La Beat labels house band, The LPT’s (La Beat Production Team) and was later briefly associated with the ill fated Lemon’s families Gold Records. 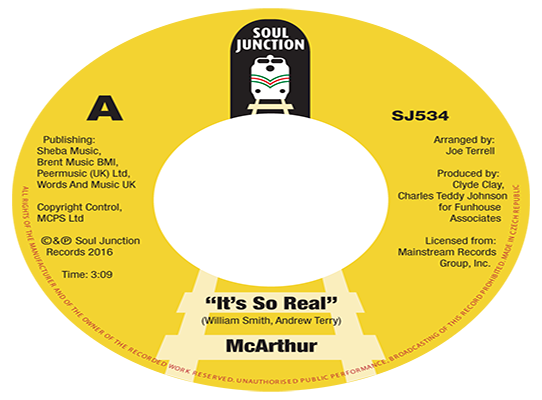 Mike Terry had previously worked with Willie Jones during his time with the 21ST over at Joy Records as a songwriter and arranger but it is the former owner of Joy Records Joe Terrell who is credited as the arranger on McArthur’s ”It’s So Real” side ? 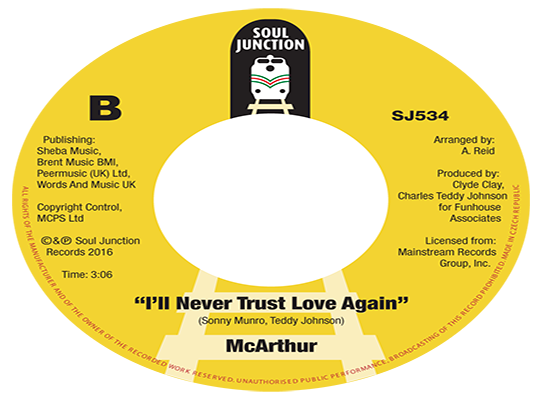 The B-side had begun its life under the working title of “If I Live For A 100 Years” but was eventually released using the second part of the hook line “I’ll Never Trust Love Again” written by the songs co-producer Teddy Johnson and late former lead singer of the Falcon’s (Big Wheel) Carlis Sonny Munro. The String arrangements on both sides were provided by The Detroit Symphony. The result is two excellent mid 70’s soulful ballads that of late have been gaining some belated attention and have become very sought after.